This weekend is Memorial Day, usually called the unofficial start of Summer (the astronomical first day isn't until June 20) since it kicks off the many Summer weekend activities. Summer means lots of new activity, but really that activity has started since Spring came (whenever that is in Wisconsin whether it be 1 day or 3 months). The new or increased activity I refer to is non-4-wheeled traffic: motorcycles, scooters, bicycles, even pedestrians. Oh, and also since its not Winter that means its also Road Construction season. 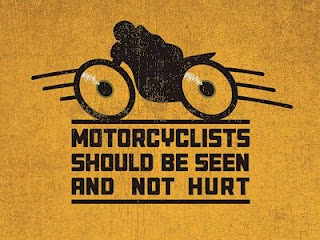 Because of all these changes in May, the month is Motorcycle Safety Awareness month here and across the nation and Memorial Day wraps it up, but really amps it up for the rest of Summer. The combination of vulnerable traffic, road construction, and mobile and in-vehicle devices makes for a dangerous brew. I know of 2 accounts of circles of friends of motorcyclists being hit by a car in the past few weeks, there was also a professional motorcycle racer, Nicky Haden, who was killed by a motorist while on a bicycle. Please, if you are out and about in a car, watch out for others around you. I know its tough to get around right now, especially downtown Milwaukee with all the construction. But take your time, be patient and attentive, and be safe for you and others. Downtown Milwaukee is pretty crazy right now. Northwestern Mutual is finally finishing their building, but building another, The new Bucks arena is under construction closing off many streets. The new streetcar rails are going in all over. There are hotels and other new construction. All on top of the annual ritual of road repair from the damage Winter made on the roads. Oh yeah and now downtown there are art installations going in you may rubberneck to see. There are barricades, cones, fences, all disrupting our view. We have calls and text coming in. We may have GPS to help us get around but it can also be as much of a distraction. And we are dealing with other cars. So now we add in other 'traffic', people who are in different lanes, different speeds, and most importantly different levels of protection in riders and walkers & runners. We need to be aware of them, and then respectful of them and their right to be there. As a motorcyclist I of course identify with the issues there, but treatment of pedestrians is often even worse. Already slowed and stuck by car traffic, people in cars are very disrespectful of pedestrians - even when they are crossing properly. But it goes beyond watching for those not in cars, we should also be better with all traffic. I see some ridiculous stuff. Lots of left turns at no left turn marked intersections (did you know 3 right turns is the same as a left - and often quicker as right turns can go on red? ), people trying to have that last spot (nay - half spot) for a car in a lane and ending up sticking out past the pedestrian walkway and even into a full lane of traffic. One thing I have noticed over the years is that the more we resist being nice, the worse it makes things, especially when it comes to merging. If you just slow a bit, leave space, and let people merge, traffic continues to flow. Traffic stops and backs up when people don't let others merge, then someone has to slam on the brakes to let that person merge, then there's the domino effect, possibly a fender bender when someone can't react in time. I drive through downtown, in rush hour, so I know the headache it is for drivers. You might have to wait through multiple traffic lights to even go straight, more if trying to turn. But we can't let the frustration get to us and scoot through a red, turn across pedestrian walkway, or leave our tail end sticking out just to sneak in that last spot. If anything we need to be more patient now, be more accommodating of others. I'm not a religious person, but I'm a fan of The Golden Rule. Here's my take on it: If you were in that position how would you want the person in yours to act. There's one word for it: hypocrisy. If what someone else is doing frustrates you, you shouldn't do it. Say you are waiting to turn left, the light is turning yellow soon to be red, but there's only room for one car in the lane you are heading to. Then someone as its basically red turns right and takes the spot leaving you stranded in the intersection. Since they are turning right they can do it anytime, while you have to wait on green so you have less opportunities to get there. Of course cyclists and pedestrians need to take responsibility as well. As a driver I can also be frustrated when I think I am pretty aware and accommodating, but those on 2 wheels or foot do their own crazy things. Pedestrians downtown need to use the walk signage just as drivers do their traffic lights - don't glare at me in my car if I am driving through a green light and you are crossing on a Don't Walk direction or you are walking across the street when the crosswalk is a few feet away. Bicyclists need to remember that just because they are smaller and can get around, if there are lanes marked for them use them and you are to follow traffic the same as other vehicles. Here is a great article by Best Motorbike Jackets for motorcyclists on riding safely. I think I am pretty aware and accommodating. I will let a bus in so it can get its passengers where they need to go, I leave a spot and wave in cars to turn into my route, I always watch for motorcyclists and especially bicyclists in my side mirrors. One area I can probably improve on is pedestrians, especially when not in the right of way (but then they should use the right of way.) I wish other people would think of others more and again just think, if you were that person what would you want you to do in the situation. The more we all put ourselves in each others shoes and act treat them how we would want to be treated the better we will all be. Slow down and let the pedestrian cross, let the car merge in, let the bus in, watch for a bicyclist on your right when trying to scoot around. Be aware, then just be nice. You would want someone else to do the same for you.